McGinley oversaw Team Europe’s win in 2014 and earned praise back then for being the man who ‘outsmarted’ the Americans. This year he’s appearing as a pundit for Sky Sports and it didn’t take him long to take aim at his fellow Northern Irishman McIlroy. McIlroy was partnered with Thorbjorn Olesen in the morning fourballs but the pair had a stinker against Dustin Johnson and Rickie Fowler. They were 1 up through 8 before losing five of the next eight holes in a 4&2 defeat. Rookie Olesen carded just one birdie all round while McIlroy, the senior man in the partnership, didn’t record any. McGinley was left unimpressed and he told Sky Sports: “The real disappointment there was not the performance of Thorbjorn Olesen, it was the performance of arguably your second best player after Justin Rose, according to the rankings. “Rory didn’t make a birdie. He was the only player out of all the players that played this morning mot to make a birdie. 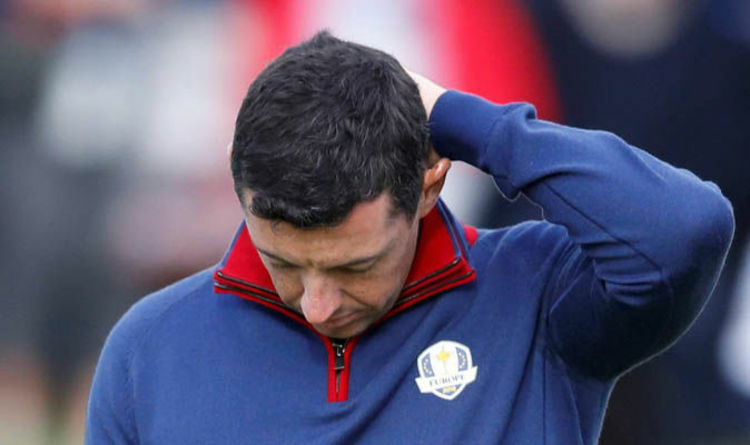 “If you’re going to win Ryder Cups, you need to stand up. Captain Thomas Bjorn has kept faith in McIlroy this afternoon despite his poor show. He joins Ian Poulter to take on Bubba Watson and Webb Simpson. Fellow pundit David Howell, twice a Ryder Cup winner, thinks Bjorn’s decision to keep McIlroy in is the right one. He said: “You’d be a brave captain to stand down your second best player – you’ve got to have faith in Rory. “Poulter’s energy will help Rory this afternoon. They have a great history together.